Something to Muse About: MOZGI's Best Artists Team Up for Hit "Промінь"
MOZGI is fast-emerging as one of Ukraine's biggest power-house companies for producing hit artists and songs. 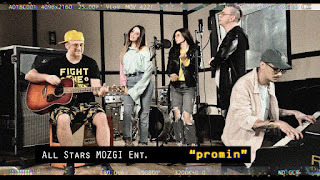 Their biggest acts, duo Время и Стекло, the MOZGI group, and solo artist Michelle Andrade who are all signed to the same company have teamed up to release a song in Ukrainian, "Промінь", under the group name "All stars MOZGI Ent." Though the only 'music video' posted as of now is merely a lyric video of them recording the song together in the studio, the song is very well put-together. We're willing to overlook the lack of a flashy music video considering how busy each of these acts is with their own releases outside of this collaboration.